The world’s most influential and enduring framework for personal and professional effectiveness. The 7 Habits of Highly Effective People has sold more than 25 million copies in 40 languages worldwide, and remains one of the best selling nonfiction books in history. Reading The 7 Habits of Highly Effective People is a life-changing experience. The book has guided a diverse generation of readers for the last 25+ years. Presidents and CEOs have kept it by their bedsides. Students have underlined and studied passages from it. Educators and parents have drawn inspiration from it. Individuals of all ages and occupations have used its step-by-step framework to adapt to the demands of the 21st century and achieve personal effectiveness in all areas of their life, both professional and personal. 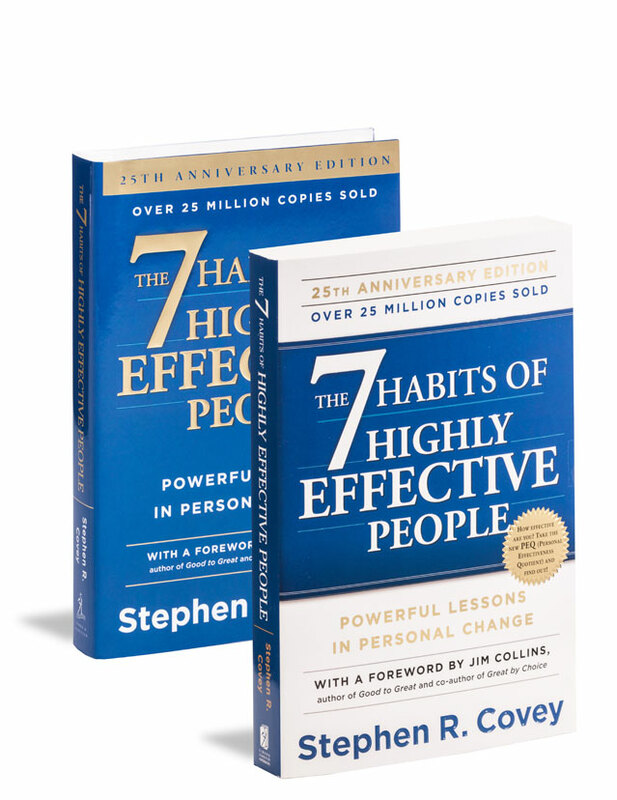 The 7 Habits of Highly Effective People continues to guide and inspire millions. It persuasively shows them that developing personal effectiveness can guide them on the road to happiness and help them lead the changes that will make the world a better place. The world’s premier personal and professional development solution for educators. 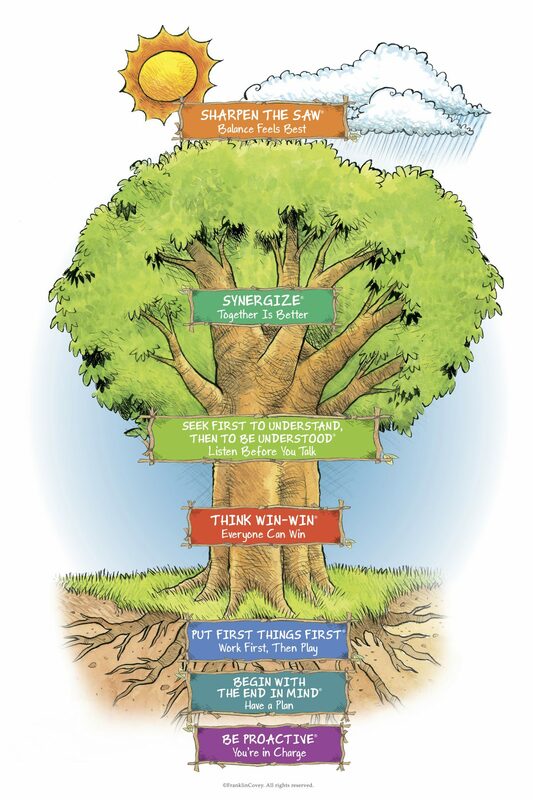 7 Habits training is the cornerstone of Leader in Me implementation and establishes the fundamental paradigms and behaviors that are critical to improving school culture. The 7 Habits of Highly Effective People: Signature Edition 4.0 is a two-day workshop experience that introduces timeless principles of effectiveness in a practical framework for all staff members. Before students can truly learn and apply the 7 Habits, staff members must sincerely live and model them. Focus and act on what can be controlled and influenced, instead of what cannot. Define clear measures of success for both life and work and create a plan to achieve them. I’m asked fairly often: ‘Are the 7 Habits of Highly Effective People still relevant today?’ And for that matter, ‘Will they be relevant ten, twenty, fifty, one hundred years from now?’ My answer: the greater the change and more difficult our challenges, the more relevant the habits become. The ideas embedded in the framework are timeless. They are principles. This is why they work, and why they speak to people in all age groups around the globe. In a world of change, disruption, chaos, and relentless uncertainty, people crave an anchor point, a set of constructs to give them guidance in the face of turbulence. – From the forward to the 25th Anniversary Edition of The 7 Habits book, written by Jim Collins, bestselling American author and lecturer on the subject of company sustainability and growth. Between stimulus and response is the freedom to choose. Habit 1: Be Proactive is about taking responsibility for one’s own life. Proactive people don’t blame parents, circumstances, or conditions for their behavior. Instead, they choose to focus on areas of life that lie within their circle of influence. Rather than allow other people and circumstances to shape one’s life, Habit 2: Begin With the End in Mind, reconnects individuals with passion and purpose. By outlining a personal mission statement, a plan for achieving greatness can then be established. Habit 3: Put First Things First is about time management. The Time Matrix® provides a model for identifying and prioritizing tasks based on urgency and importance. Truly effective people ensure the most meaningful tasks related to their personal mission statement are accounted for in weekly and daily planning. In living Habit 4: Think Win-Win, people work effectively and efficiently with others to achieve optimal results. Society fosters competitive and selfish behaviors that produce win-lose or even lose-lose outcomes. A win-win mentality is a balancing act between courage and consideration that ensures true collaboration takes place in all conflicts. Unknowingly, in conversation we filter what we hear through our own life experiences and frame of reference. Before a person finishes what they are saying, we’ve already formulated a response. Habit 5: Seek First to Understand, Then to Be Understood teaches the art of sincere, reflective listening. Synergize is the habit of creative cooperation and can only be achieved by valuing the diverse paradigms and opinions of others. In a synergistic environment, true collaboration takes place because the whole is always greater than the sum of its parts. Habit 7: Sharpen the Saw challenges a person to seek continuous improvement and renewal. Overcoming burnout can be achieved by taking time for oneself through physical, social/emotional, mental, and spiritual renewal. 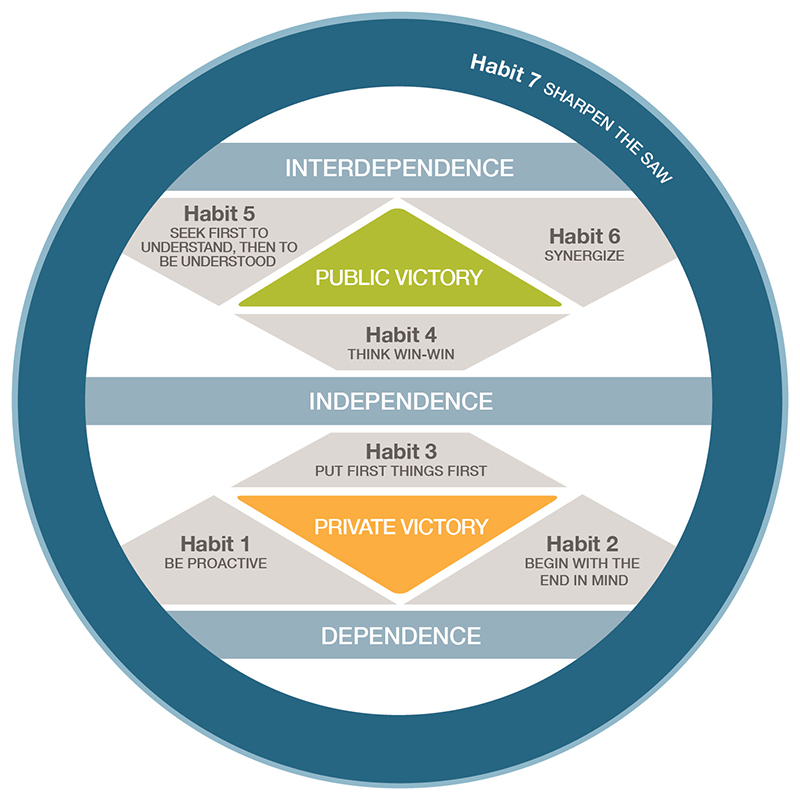 Habit 7 is revitalizing and helps establish greater capacity for self-improvement. Ten years ago I attended a seminar where Dr. 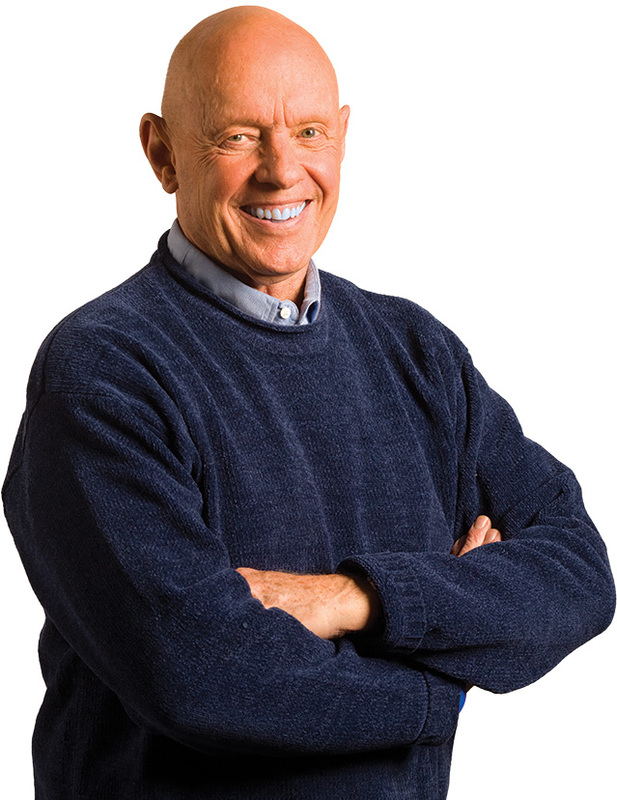 Covey taught the 7 Habits to a large audience of adults, mostly corporate leaders. As I looked around the room and saw how engaged everyone was, I couldn’t help but think, ‘Why wait until people are adults to teach them these skills?’ Soon afterward we began teaching the 7 Habits at our school, first to staff and then to students–even five-year-olds. The influence it has had on our school over the past decade has been amazing. In my 36 years in education, I have never seen anything have such an impact on student achievement, teacher retention, and parent satisfaction. It thrills me that students are now learning these same powerful habits in schools across the globe through Leader in Me. Students are introduced to the 7 Habits through in-class lessons and by integrating principles through a schoolwide culture. When the 7 Habits resonate with students, teachers, parents, and administrators can see, hear, and feel how life-ready leaders are demonstrating principles of responsibility, discipline, and teamwork. 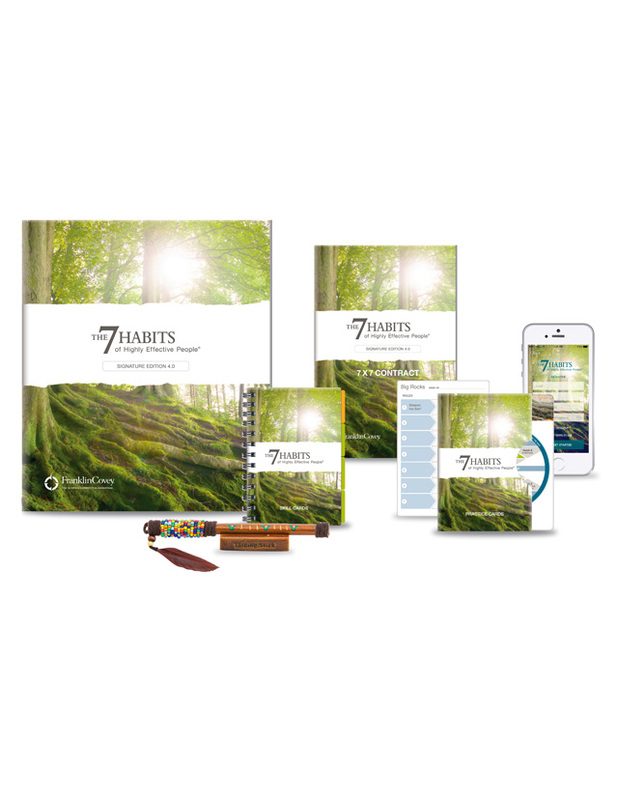 Schools that embrace the 7 Habits integrate them in a variety of unique and creative ways, like hall murals and signs, classroom art, school songs, student speeches, leadership roles, and service projects. As part of the Leader in Me implementation, students learn to apply the 7 Habits not only at school but in all areas of their life. 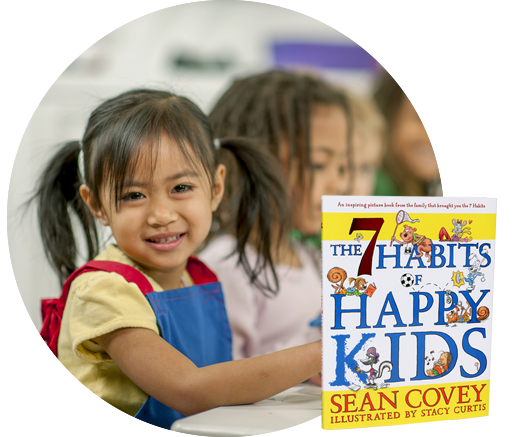 The 7 Habits of Happy Kids characters create a fun learning experience for elementary students in books, videos and more. Goob the Bear, Jumper the Rabbit, and the rest of the gang are featured in a variety of stories that illustrate the 7 Habits. These engaging stories can be shared in class or at home and teach important life-skills to younger students. Put Your School On the Path to Greatness! Engage faculty, students, and parents in an unparalleled journey of personal transformation and effectiveness.